Suneden provides four Toyota Coaster buses to transport its students, with three of these buses being wheelchair accessible. We gratefully acknowledge the Variety Club of SA in their generosity and support of our bus service over the years. Our buses are primarily used to transport students between school and home. 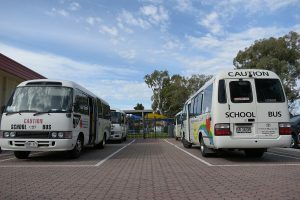 This service is offered to students that are able to manage the duration of the journey with our guiding principle being the safety of all bus users. Each bus is staffed with a regular driver and a bus assistant from one of our Student Support Officer (SSO) staff. Suneden operates within a zone, outside of which, we have a number of pick up/drop off points. If students live inside the zone they are collected from their home. Bus schedules and pickup points are reviewed each term by our Bus Coordinator. Our buses are also utilized for activities during the days such as swimming, gymnastics and other excursions. A number of our staff hold bus licenses in order to make this possible.